The PlayStation 4’s launch line-up features a wide variety of games that cater to different audiences. 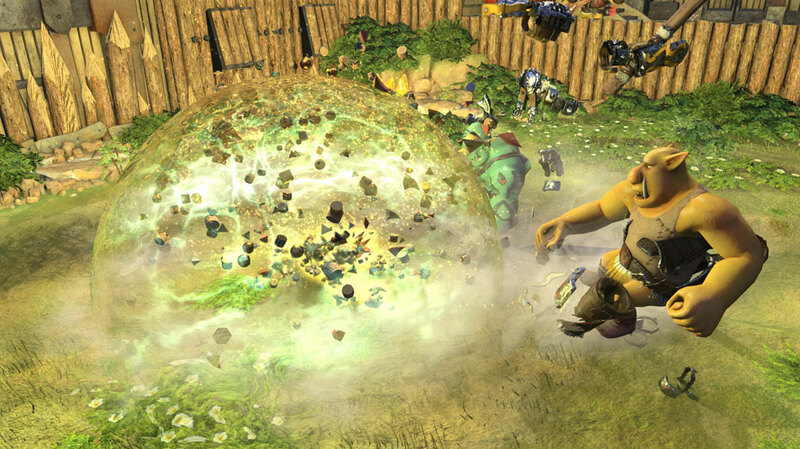 Among the more mature experiences and arcade-style shooters, here sits Knack. To summarize what the latest project from Mark Cerny and SCE Japan Studio is, perhaps it helps to have a background in the history of platforming games. There are franchises that have been around since the beginnings of the medium; they’ve endured—those are Super Mario Bros, Sonic the Hedgehog, Kirby, Mega Man. And there are franchises that were created as a result of the “old school” era like Jak and Daxter, Ratchet & Clank, Spyro the Dragon and many more. There’s some quality stuff to be found out there! But every once and a while, there’s a project that just makes you tilt your head a little to the right and go, “Huh?” when I mention them, like…Ty the Tasmanian Tiger for example. There’s a method to my madness. Stick with me as I attempt to explain where Knack falls in the platforming hierarchy, as well as what makes it unique (possibly an ideal launch-game for some). 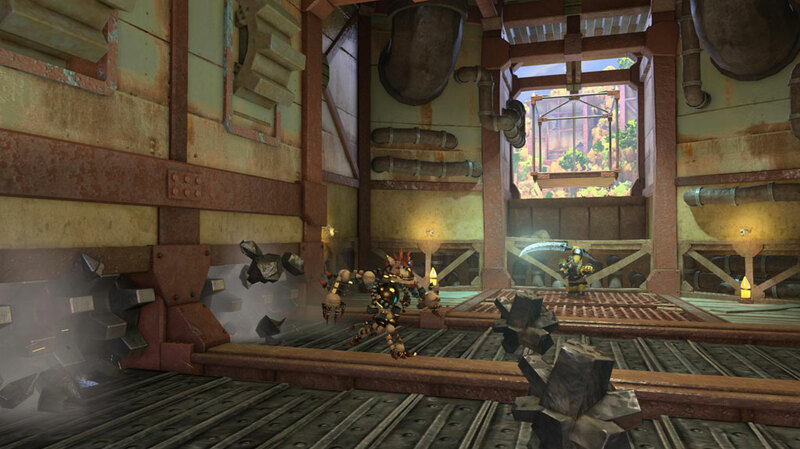 At its core, Knack’s presentation is very similar to a Saturday morning cartoon. Its story is simple—you know who the villains are right away, despite various characters being ignorant to others’ true motives. It’s the kind of plot that will seem incredibly obvious to most adults, but will leave children ( who haven’t seen the tropes in 20+ years of gaming) with enough motivation to continue on. It’s a story that features enough intrigue to play, but definitely not enough to be memorable. 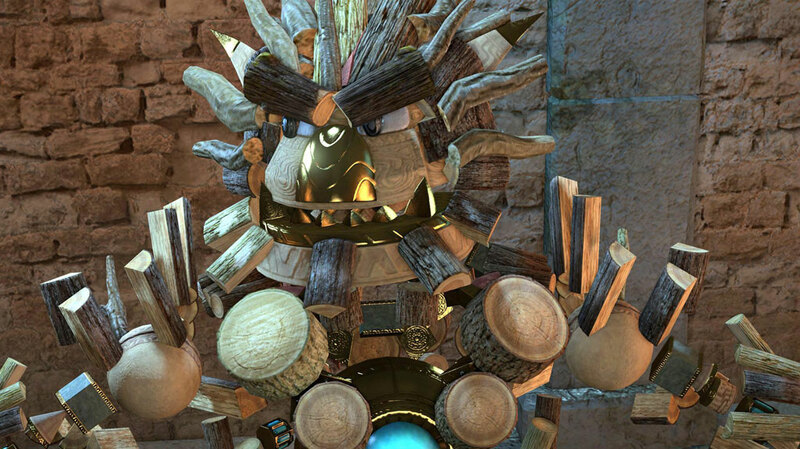 Knack is a cute little robot creature (with a deep voice that really doesn’t match his tiny size) made from relics, whose normal purpose are to power the world. He was created by a kind-hearted professor who occasionally lets science get the better of him. The professor has a love-interest, Charlotte, who’s gone missing a long time ago. Plenty of other tropes to be found in the plot—a power-hungry man who seeks to usher in a new era by researching relics, a strong-looking and strong-willed companion by the name of Ryder, a nephew who gets into trouble from time to time—all the usual fare in adventure stories. As I said—it’s quite basic and predictable, but to certain people, it may have its charm. The game certainly looks good enough to capture the attention of kids and adults alike. Graphics are solid enough, and so is the game’s music, but… I suppose it’s time to cut to the chase. 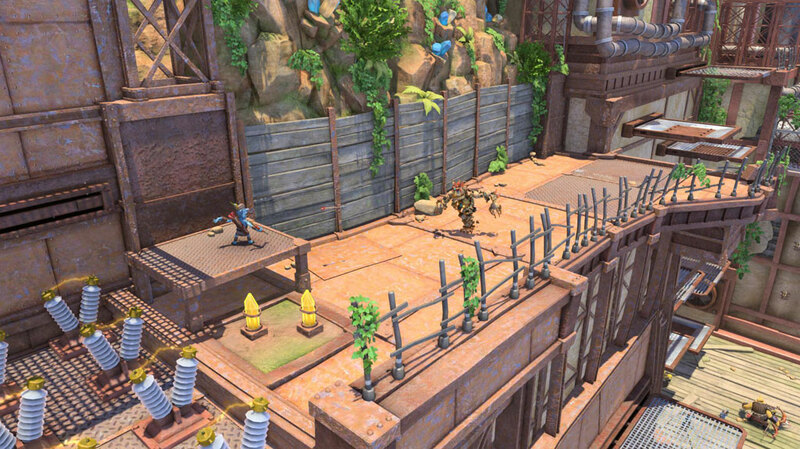 Everything about Knack is very polished. You can tell the development team put effort into what they were creating. Nothing is broken, and nothing will frustrate you. It’ll impress anyone young enough to look past the fact that this kind of game has existed (and been done better) for decades, but…really, the non-gameplay elements of Knack are nothing groundbreaking. Environments, characters—the entire world—it all just screams “seen it”. Still, if you’re willing to take my words with a grain of salt, it’s at least entertaining. It didn’t feel like I’d wasted my time when I saw the credits, but… it will, perhaps, to many others. Gameplay is, unfortunately, nothing groundbreaking either. 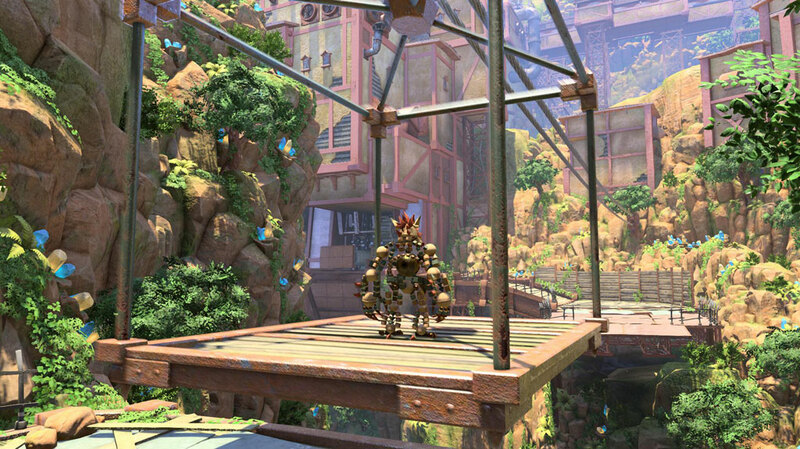 Sure—there are plenty of things done well, and I suppose I’ll start off on a good note here: Knack doesn’t stay tiny. 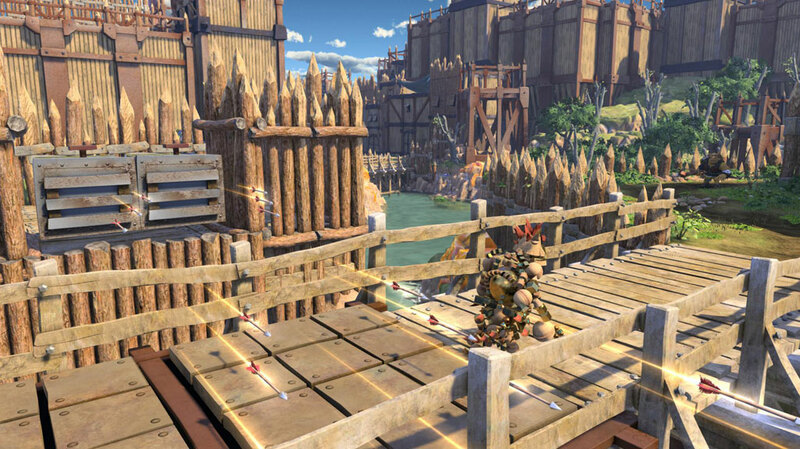 You tend to start out each level small (and fighting enemies provides a decent challenge because of how fragile Knack is when he’s tiny), but as you explore, you amass relics and grow larger. By the end, those massive foes you had a hard time with can be disposed off with a simple whack. Philosophically speaking, I’d say that’s to the game’s credit. But it doesn’t make battling any less repetitive. “Press a button enough, win”. That’s how things roll with Knack. Granted, you’ll be skillfully dodging stuff occasionally, but combat just…doesn’t mix itself up much. You can collect crystals to unleash super-powerful attacks if certain foes give you a hard time, but…super-powerful stuff is over in the blink of an eye. It’s like the game gives you a sense of adrenaline, but before you even blink—it’s gone. Here’s something cool, though: In each level, you may find a treasure chest or two. You can either choose to receive what piece of treasure (to make gear, which makes battling even easier and unlocks the occasional skill) the game randomly generates for you, or you can get an item your friend found in the same chest. That’s right—the game features some degree of social interaction, which (I suppose) helps with replay value. There’s trophies to help out with that too. 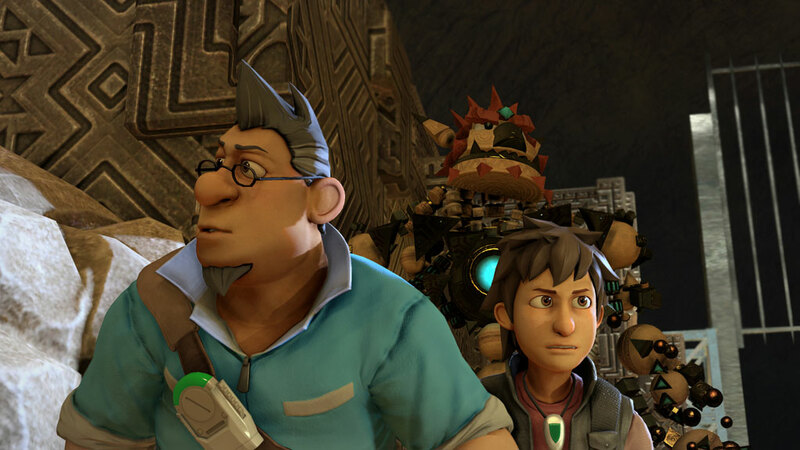 Knack kind of misses its mark. 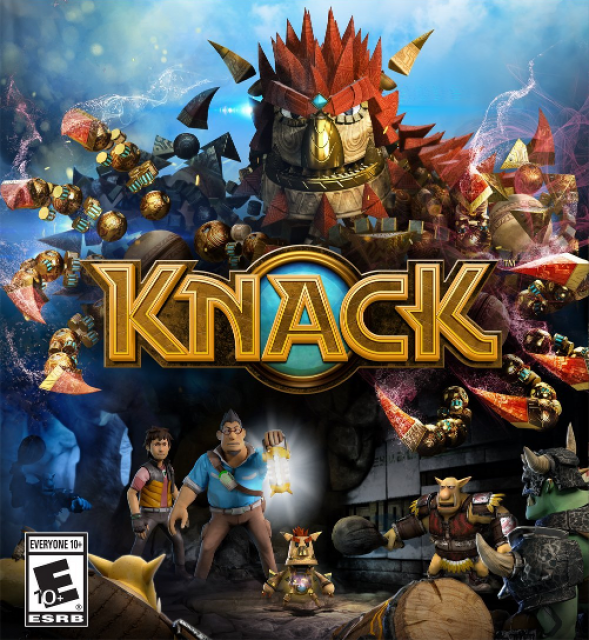 I can appreciate the whole “Saturday morning cartoon” mentality that went into creating characters and plot, but it will not help Knack stand the test of time. Add somewhat basic gameplay that forces players to undergo some of the same challenges over a twelve hour experience—that won’t help much either. I consider Knack worth the purchase to PlayStation 4 early adopters looking for a decent way to pass the time on their brand new system, but…once things start coming out and developers begin to use everything they have to its full potential—Knack will become utterly forgettable. I can only recommend Knack to the small percentile of people who want to mix a little whimsy into the dark, mature launch line-ups of the PlayStation 4 and Xbox One. It’s sometimes fun, but mostly forgettable. Not broken, but entirely too basic. Even in the face of platformers I’ve played on PlayStation 3 recently like Castle of Illusion and Black Knight Sword—Knack, while being made of rocks and relics, seems made of cardboard at heart.